Is one of Greenpoint’s most unexpected features­­­—a stretch of historic wooden block paving on West Street near the Greenpoint Terminal Market—in imminent danger? Many say that this is the last place where original wooden paving exists in New York City. These blocks are so rare that one from this section of sidewalk is included in the collection at The City Reliquary. But a new bike path down West Street could mean this final vestige of obscure New York City history will be put on the chopping block. A recent New York Times Streetscapes column focused on the many materials used to pave the streets of our city over the years, including raw earth, gravel, cobblestones, and granite blocks. Although in the 19th century stone blocks were generally thought of as an improvement over previous materials, the blocks often came loose and manure would get trapped in the joints between the stones (lovely). And the manure problem was apparently no joke; an article cites that in 1870 half a million cartloads of manure had to be removed from the city streets. Around that same time, The New York Times came out in favor of wooden blocks as pavers, which were typically laid in squares with the end grain exposed. When properly constructed, the resulting street surface would be smoother than stone and much quieter since the wood would muffle the clomping hooves of horses. But wooden blocks had their disadvantages. The wood was not as durable as stone and wheel ruts would form. This paving system was also more expensive and prone to rotting, which would release a nasty odor. A coating of creosote (basically a tar preservative) could slow the decay, but this coating was flammable and had its own unfortunate smell. Last but not least, the blocks would absorb horse urine and could become slippery (with rain, and apparently the before mentioned horse urine). Not sounding like the best paving choice anymore! Nevertheless, wooden blocks were not uncommon in 19th-century New York City, being much preferred in high traffic areas where the wood blocks would muffle the street noise. This is presumably why they may have been used to pave Greenpoint’s West Street. Although now West Street might be one of the neighborhood’s quietest streets, this was not always the case. 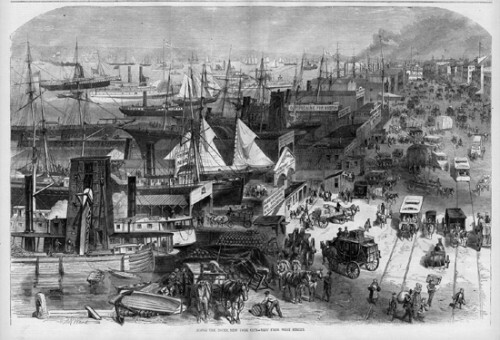 Where today one might find an occasional jogger or stray cat, 100 years ago the street teemed with longshoremen, industrial workers, ferry commuters, carts, carriages, etc. 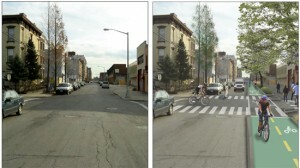 But the street may once again teem with users with the proposed bike path that will eventually connect Greenpoint to Sunset Park. According to Preservation Greenpoint, Brooklyn’s Community Board 1 approved the bike path plan, and it is now at the Department of Transportation (DOT). There is a short summary of the project here. While the plans seem sketchy and may have changed over the past couple of years, the proposal originally included a narrowing of the sidewalks on each side. But no mention of the wooden block sidewalk on West Street was made. One must wonder if any thought has been given to the blocks’ preservation or incorporation into the reconfigured street. Considering that these are likely the last wooden paving blocks in New York City, is there not a way that this layer of history can be preserved or at least salvaged and relocated? The DOT has a history of designing with historic fabric in mind (e.g. the smooth, bike-able cobblestones for the bike paths of Vinegar Hill and DUMBO) so why not special consideration be given to this unique part of Greenpoint as well? 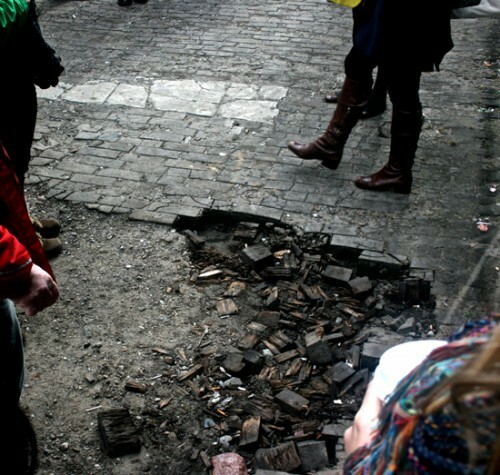 In The New York Times Christopher Gray calls the fragments of old paving that survive in the city “mesmerizing,” romantic, and part of a “delicious tableau.” Although our streets must be modified to remain functional, important historical artifacts such as these do not need to be lost in the process. What do you think, Greenpoint? Do these deserve to be saved? And does anyone know more information about this bike path? If so, contact Preservation Greenpoint at info [at] preservationgreenpoint [dot] org with any details on how this proposal may affect these historic wooden blocks. 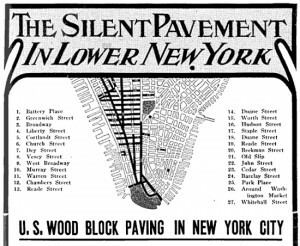 To learn more about the wooden paving of New York City, check out this great blog post at Manhattan Past. ← Video: Greenpointers Short of the Week! Where on West St is this little stretch of wooden paving? I’d like to see it before it goes!